I have come to count on the Arts as a key component in my coping tool kit. I started this series of small colored pencils drawing during some of the colder days in late spring and early summer. These are a great diversion for me. They are also guilt-free because I can get horizontal on my Ostrich Cot to make them. At only 4″x 4″ to 6″ x 6″ these little projects are easy to transport and make me look a little less like a lazy person when I am remembering NOT to be vertical too long. I am planning to eventually include the Medicine Ball series in the Print Your Own Collection available for sale in my studio shop. These are small pieces of my original art that patrons can print and use for their own DIY home projects. For now, YOU can get a FREE easy to embellish version of this little doodle in the attachment on my Patreon page here. 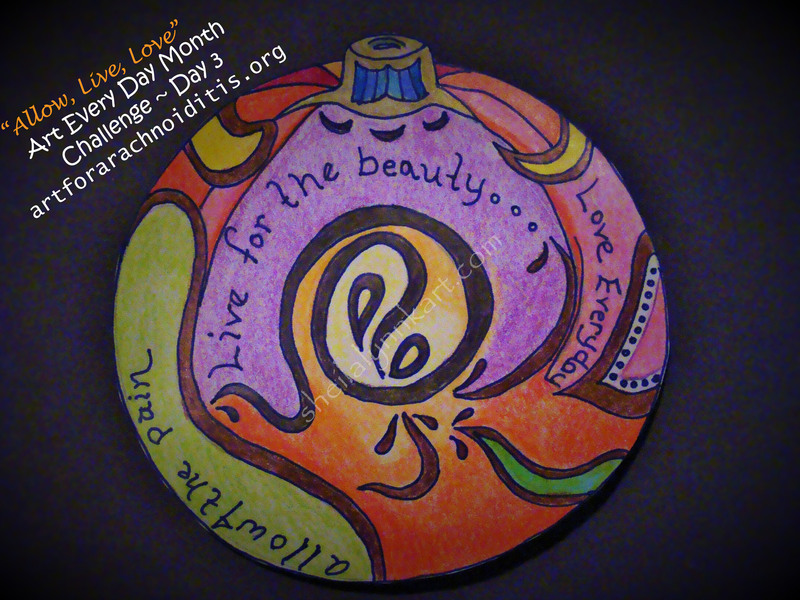 I have decided to participate in Leah Piken Kolidas’ Art Every Day Month Challenge during the Month of November. For the first time, as I do this 30 day challenge, I will be posting my progress HERE for arachnoiditis survivors and advocates.